auction site to sell property seized in criminal cases. DETROIT >> Seeking more bids and higher prices, the U.S. Marshals Service has begun to rely on an online auctioneer to sell real estate and other assets seized in criminal cases across the country. Government property that has gone on sale at Bid4Assets.com of Silver Spring, Md., includes a drug dealer's ranch in Hawaii, a Florida con man's luxury helicopter and an inner-city Detroit grocery store where police say heroin was peddled. Three Big Island ranch lots in Kamuela, Hawaii, sold for a total of $435,000. The land was seized from international drug dealer Claude DuBoc, who pleaded guilty in 1994 to money laundering and drug conspiracy charges. "We are pleased that we have been able to help (the Marshals Service) sell in less time, for less expense and earn higher returns for the U.S. taxpayer," said Bid4Assets.com Inc. Chief Executive Tom Kohn. The site was founded in 1999 and began to auction government-seized property in December of that year. The company has worldwide exposure and "worldwide ability" to handle bids, said company President Jim Russell. The private company has sold more than 4,000 properties for a total of more than $1 billion, Russell said. About 32,000 people have registered to use the bid site, which employs 35 people. The customers and merchandise handled by the site vary greatly, from tax-delinquent houses sold for Kern County, Calif., to loans of failed banks. A specialty of the site has become selling assets of dot-com companies brought down by the bursting of the Internet investment bubble. 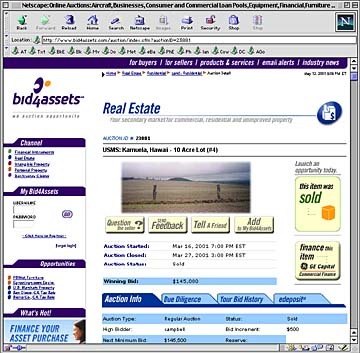 Bid4Assets has been retained to sell assets for more than 20 failed or restructuring Internet and technology companies, including Value America Inc., Boo.com, eCitydeals.com and CivicZone.com, said company spokeswoman Michelle McCann. But among the company's most valued customers is the U.S. Marshals Service, and for good reason. Empowered by Congress in 1984 to dispose of property seized by other federal agencies, the Marshals Service has handled more than $9 billion in assets over 16 years. Faced with the burden and complexity of disposing of a wide range of items, local marshals offices frequently turn to outside experts for help. In Detroit, Marshals Service property disposal expert Diane Burrell says the sales of seized property can be very time-consuming. In past commercial real estate transactions, she went through loads of paperwork, including obtaining bids from at least three auctioneers. When it came time to sell two commercial properties seized recently in drug cases, she said she jumped at the chance to try Bid4Assets, pre-approved by Washington headquarters to sell real estate for the Marshals Service. "This is our first online auction," she said. Bidding began May 2 and runs through Wednesday. The larger of the two Detroit buildings is a 71-unit apartment tower with 6,134 feet of commercial space below. It belonged to Joseph Foster of Detroit, who was indicted in 1997 along with 12 others in a drug conspiracy and money-laundering case. Foster died before trial. The government said the site was used for drug dealing and other illegal activities. The smaller property includes a 3,578-square-foot storefront and 14 apartments. The former owner, Ghassan Poota, was one of 14 people charged in 1997 with drug trafficking. Prosecutors said Poota's Summerset Market was used to sell heroin. The charges were dropped, but the government seized the building as the proceeds of illegal drug sales. >> A secluded mountain cabin in Montana and 58 surrounding acres near Wolf Creek, seized from imprisoned drug dealer Dickie Diebert. >> A 1994 Lamborghini Diablo VT sold for $125,000. The U.S. Drug Enforcement Administration seized the car in San Diego, saying it was purchased with the proceeds of illegal drug sales. >> An Italian-made Agusta luxury helicopter sold for $655,000 on May 3. It was seized from Frederick Brandau of Davie, Fla., who prosecutors say swindled investors of more than $100 million. >> Established by Congress in the 1984 Comprehensive Crime Control Act to centralize the disposal of property seized by various federal agencies. >> Proceeds from the sale of forfeited cars, real estate, jewelry and other property are used to finance law enforcement activity. >> More than 200 federal laws have property forfeiture provisions. Most seizures come from drug, money laundering, organized crime and fraud prosecutions. >> The service now holds about $1 billion worth of assets. The program has handled more than $9 billion in property since the program started.